The Clean Air Partnership is focused on motivating area residents to take voluntary steps to clear the air this fall by taking advantage of the numerous options to reduce the number of solo commutes. RideFinders is just one of the many organizations that proudly serves the St. Louis region with a mission to improve air quality and reduce traffic congestion by encouraging alternate transportation options. With transportation-related emissions being one of the biggest contributors to air pollution, RideFinders offers a path to reduce those emissions by providing a free carpool and vanpool ride matching service for commuters to help improve the overall quality of the air. RideFinders works with employers, colleges, trade schools, municipalities and virtually any other type of organization to help commuters rideshare to and from work and school. Carpool & Vanpool Matching – RideFinders offers these services to match eligible commuters with other nearby commuters who also share a similar route to work or school and have similar commute schedules. Carpools remove nearly 4,500 vehicles and 150,000 driving miles from our region’s roadways daily – easing traffic congestion for everyone. Guaranteed Ride Home Program — This program provides ridesharing commuters with four free taxi rides home per year in the event of an emergency or if they must stay late or leave early from work or college – guaranteeing peace of mind. Employee Transportation Coordinators (ETCs) – Becoming an ETC with RideFinders is a great way to help promote commute alternatives to fellow co-workers and distribute air quality and transportation related information within a company or organization. 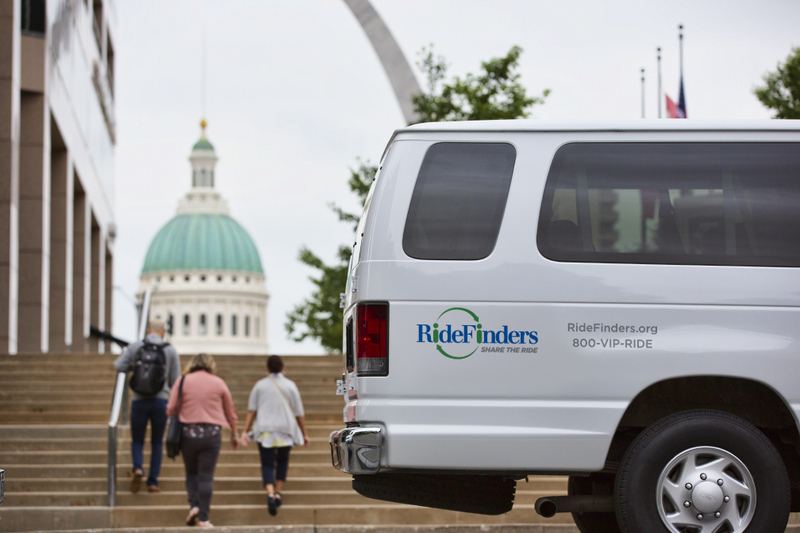 Over 900 St. Louis area employers, colleges and other organizations participate in RideFinders as “ETCs” to help thousands of commuters rideshare and clean the air. Save Money – Not only is ridesharing helpful in the fight for cleaner air, but it also helps reduce the cost of gas, maintenance and parking fees for commuters who are sharing the ride There is no cost or liability to join or participate in the program as RideFinders operates as a free public service for the region through federal funding! For more information about RideFinders check out their website at http://www.ridefinders.org/. Now that the prime of summer has reached us, the importance of keeping the region’s air clean is at an all-time high. The Clean Air Partnership, along with several other organizations, helps play a significant role in raising awareness about all the ways people in the St. Louis region can reduce emissions to help keep the air quality in healthy ranges. With transportation being one of the biggest contributors to air pollution, much of the focus is on communicating the many benefits of alternative transportation options, such as transit use or carpooling, or walking or riding a bike when air quality conditions are good. Don’t let worry about potentially needing a car during the day derail plans to share the ride. Consider carsharing opportunities to get to and from midday errands and meetings when needed. Visit www.enterprisecarshare.com for more information. Visit gatewayguide.com or use MoDOT’s 511 travel information number to get real-time traffic information and use it to better plan your route to avoid traffic tie-ups and construction zones. Ridesharing services such as Uber and Lyft match drivers of private vehicles to those seeking transportation and are a great option for group outings to eliminate the use of multiple vehicles. For more information and additional tips to clean the air, visit www.cleanair-stlouis.com, like the Clean Air Partnership on Facebook or follow @gatewaycleanair on Twitter. As the Clean Air Partnership works to encourage activities that reduce emissions, we continue to spotlight organizations in the St. Louis region that share our passion. 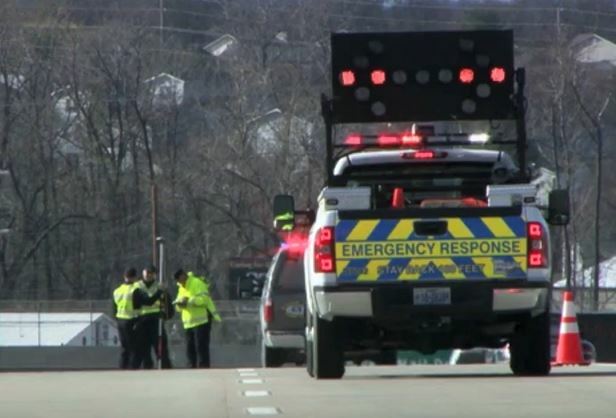 With transportation being one of the largest contributors to air pollution, the efforts carried out by the Missouri Department of Transportation (MoDOT) are crucial in championing clean air. MoDOT oversees a total of 33,856 miles of roadway throughout the state and, while commuting by automobile is necessary for many, MoDOT recognizes the importance of keeping congestion-related emissions at a minimum. Considering idling vehicles emit 20 times more pollution than a car traveling 30 miles per hour, alleviating congestion that causes stop-and-go traffic is key in promoting cleaner air. Gateway Guide – This initiative combines several tools to provide motorists with real-time traffic updates. Traffic sensors alongside the road provide information on upcoming traffic speeds and volumes. MoDOT utilizes over 100 Dynamic Message Signs across the state which are permanent message boards located along state highways used to broadcast information regarding travel times, interstate closures, vehicle crashes and congestion. The @StLouisTraffic Twitter feed shares real-time information on closed lanes and roads. 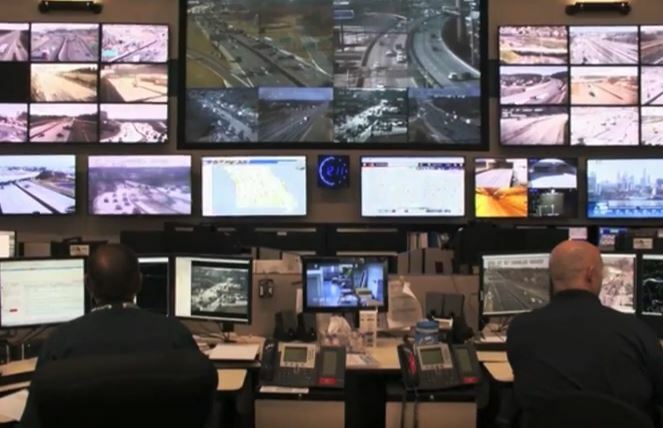 Closed-circuit cameras positioned throughout the region also provide real-time footage of area highways. These cameras provide video to help direct emergency response forces to quickly and safely address incidents. More importantly, the camera footage is streamed on Gateway Guide. MoDOT’s intent is that motorists will use this information to take alternate routes when traffic is heavy. By shifting traffic flow in various directions, congestion can be alleviated or avoided, ultimately reducing vehicle emissions. Ozone Information – During the ozone forecasting season, MoDOT operates eight portable message boards alongside roadways in the St. Louis region. These, along with the Dynamic Message Signs, present the daily ozone forecast and often provide motorists with air-friendly tips. For example, when the air quality is poor, the message board not only notifies motorists of the red state of the air, but it might also encourage motorists to avoid filling up with gasoline until after 7 p.m., to help prevent the development of ground-level ozone. These boards have the potential to reach more than half a million travelers in just one day and encourage the community to take part in activities that keep the air cleaner. Modification of Daily and Internal Operations – When the air quality is predicted to be poor, MoDOT works especially hard to alleviate congestion. This means halting routine maintenance operations on state highways that might create congestion and vehicle idling when the air quality is red. MoDOT also encourages their staff to use alternative forms of transportation and has a carpooling program in place for employees to team up to share the ride. These modifications further help to reduce pollution and improve the quality of the air we breathe. For more information about MoDOT and their work, check out their website at www.modot.org. And keep an eye on our blog for a future spotlight on the Illinois Department of Transportation to learn about their commitment to cleaner air. The Clean Air Partnership is pleased to serve a community where several organizations are playing a significant role in helping area residents take action to reduce emissions and improve air quality in the St. Louis region. One that’s really proving to be a champion for clean air is Citizens for Modern Transit (CMT). CMT leads efforts for an integrated, affordable, and convenient public transportation system with light rail expansion as the critical component that will drive economic growth to improve quality of life in the St. Louis region. The advocacy organization represents more than 20,000 riders, major employers, academic institutions, and labor and community organizations in the region and works to grow and promote modern transit initiatives. Recognizing that more people taking transit means fewer cars on area roads and highways, CMT focuses significant efforts on promoting public transportation as a viable alternative to driving alone. Those efforts are a critical component of the region’s clean air efforts. Here’s a look at just a few of the many initiatives spearheaded by CMT that are helping to draw commuters out of their cars and onto the transit system. Try and Ride – Since CMT first launched its Try & Ride program in 2014, the initiative has helped more than 5,000 workday commuters learn how to easily navigate the transit system and experience the benefits of using MetroLink and MetroBus for their work commute. Participants get to “test drive” the system with free fare for the first month, customized route information, and helpful tips for using public transit. 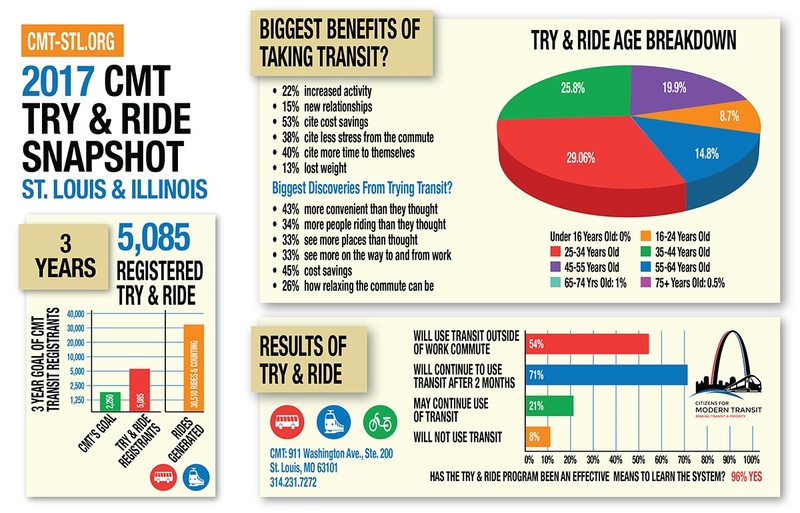 Seventy percent of those who have given transit a try through “try & ride” recognized the benefits and continued using transit beyond the two-month program commitment. To help further expand the reach of this successful program, CMT began targeting college campuses and technical schools in 2017, so students also now have the ability to experience how advantageous these options can be for the school commute. Guaranteed Ride Home – This program provides an additional incentive to commute to work by transit or bicycling rather than driving alone. It allows employees to take transit/bicycle while providing them a “safety net” – an assurance that they can get home and not be left at work if a situation arises. This program provides immediate transportation in case of an emergency, sickness or unscheduled overtime, and CMT covers 80 percent of the cost (up to $60) per emergency ride home. The GRH Program was recently expanded to include ride hailing services such as Lyft! Ten Toe Express – This innovative program continues to help area residents learn how to get around the region using a combination of their own ten toes and transit. Walk leaders – which can be an individual, a couple or even a pair of friends – guide groups of fellow walkers as they explore various St. Louis attractions, teaching them how to use the transit system along the way. In 2017, through a partnership with AARP St. Louis, the Ten Toe Express Program continued to evolve through the introduction of new walking groups, new destinations and new participants. CMT added the AARP Breakfast Bunch on Saturday mornings and gained several new partners, including Grand Center, Inc., which assisted in bringing new, exciting special walks to the line-up. For more information about CMT and their specific programs aimed at driving transit ridership, check out their website at https://cmt-stl.org/. The arrival of a new year often brings opportunities to change a lifestyle, a business, or even an entire community. If you’re looking to make a change for the better in 2018, consider making conscious changes to your transportation habits, and you could positively impact the region’s air quality and health. High concentrations of ground-level ozone can cause shortness of breath, coughing, wheezing, headaches, nausea, and eye and throat irritation. Even in healthy adults, studies have shown that exposure to various levels of ozone pollution can cause decreased lung function. But, children, older adults and those who suffer from lung diseases like emphysema, bronchitis, pneumonia and asthma are especially vulnerable to ozone pollution. When it comes to minimizing those health impacts, everyone has a role to play. Individuals can make lifestyle changes, and even municipalities and businesses can help improve air quality by changing their policies on and attitudes towards transportation. As you make your resolutions for the New Year, here are some things you, personally, can do to help improve the air quality. Carpool, vanpool or ride the bus or MetroLink whenever possible. Avoid letting your vehicle idle. Turn off the engine when you’re waiting in your car. When the weather is nice, walk or bike for short trips and to and from lunch. If public transit doesn’t work for you, try ridesharing to and from work and take advantage of We Car if you need to run errands around town. Check your air filters and replace them at least every three months. Clean air filters can improve gas mileage by up to 10% compared to clogged filters. Help your employees to share the ride by signing up with resources such as RideFinders, which can help them to connect with carpool or vanpool partners, or help employees navigate public transportation by teaming up with Metro and Citizens for Modern Transit. Offer employee passes for public transportation, or convenient parking for those who choose to carpool. Provide bike racks and lockers for employees who bike or walk to work. Create a ‘No Idling’ policy in your parking lots and instead provide 15-minute pickup and drop-off parking spots near the entrance. Offer telecommuting and flex-time, allowing employees to work from home or come in at times that do not coincide with rush hour traffic. Conduct meetings by conference calls and video chats instead of traveling to meet in-person. By committing to promoting practices that improve the air quality in your community, municipalities can have a huge impact too. Develop and implement a no-idling policy for fleet drivers and city employees, and encourage residents in busy pick-up and drop-off zones to avoid idling. Utilize biodiesel to fuel city trucks, and ensure the tires are properly inflated and air filters are clean. Provide dedicated carpool spaces at city buildings to encourage city employees to rideshare more often. Develop and implement a bike and walk master plan designed to encourage residents to walk or bike more to get around town instead of driving, and install bike racks around the city. Provide city landscaping crews with electric, propane or solar-powered lawn and gardening tools, instead of gas-powered ones. For more great tips on how we can work together to achieve cleaner air in 2018, visit www.cleanair-stlouis.com/air-quality-tips/, like us on Facebook or follow us on Twitter at @gatewaycleanair. And have a happy and healthy New Year! A new AAA Foundation for Traffic Safety survey has revealed that Americans spend an average of 17,600 minutes driving each year. That’s almost 300 hours or the equivalent of more than 12 days! With vehicle emissions being one of the top contributors to poor air quality, all this time behind the wheel is taking a big toll on the environment and the lung health of individuals nationwide. According to the U.S. census, much of the time behind the wheel is spent driving to work, with Americans spending an average of 25 minutes commuting to work every morning; and 75% of Americans make that trip alone each day. Commuting to work with a friend, significant other or coworker can help reduce some of the negative lung health and environmental factors associated with driving, while also yielding a host of other benefits that go beyond better air quality. Fewer emissions and less traffic – For starters, more people in carpools doesn’t just reduce the amount of ozone forming vehicle emissions in the air by keeping some cars off the road, it can also reduce traffic congestion resulting in a less stressful commute for all. Increased social interaction – As an added bonus, spending time in the mornings with other people on your daily commute offers opportunities for face-to-face social interaction, something we could all use a little more of in our technology driven lives where texting and social media are the primary methods of communicating. That interaction is especially beneficial to those with depression according to Psychology Today. Lower commuting costs – Carpools are also a cheaper alternative to driving solo to work every day. Double up with even one other person to share the ride and you’ll be able to cut your weekday fuel costs and parking fees in half while also reducing wear and tear on your vehicle if you take turns driving. Add a third or fourth carpooler and you can save even more! With all those advantages, maybe now is the time to say goodbye to your solo commute and say hello to some new carpool buddies. For more information on alternative transportation options that can help improve our region’s air quality, explore our website, like us on Facebook or follow us on Twitter @gatewaycleanair. It’s January, and Old Man Winter has a tight grip on the St. Louis region. If the cold temperatures and threat of snow and ice have you wishing you could hunker down and work from home, you’re not alone. In fact, many individuals are enjoying the many benefits of telecommuting – both during the cold weather months and year-round. Telecommuting is a convenient way to reduce or eliminate the work commute, taking cars off the road and reducing the vehicle emissions that lead to air pollution. Current statistics indicate that nearly 85 percent of American office employees work from home more than once a month, and almost 25 of employees telecommute weekly. In addition, more than 40 percent of U.S companies have implemented some type of telecommuting policy. Increased productivity: Many believe that giving employees the ability to work from home will mean that they will work less. However, studies show that telecommuting actually has the potential to increase productivity. Specifically, a study from the University of Texas at Austin, showed that telecommuters accomplished 5-7 more hours of work than their counterparts who worked in the office. Less employee turnover: Long commutes can result in unhappy employees and higher turnover for companies. Research has shown that the ability to telecommute results in more satisfied employees who remain in their positions much longer than those who are required to work in the office each day. Improved morale: Telecommuting helps to promote a better work/life balance, resulting in employees that are happier, feel more valued, work harder and are more invested in the companies they work for. Money savings: Working from home cuts employees’ commuting costs, while also saving employers money. Estimates indicate that a company saves $11,000 annually for each employee who telecommutes. For more information on telecommuting and other alternative commuting options, explore our website, like us on Facebook or follow us on Twitter @gatewaycleanair. With the summer season over, children across the region are now settling into their back-to-school routines. If you’re one of the many parents who drive their children to school each day, now is a great time to consider other transportation options that can help reduce the emissions that lead to air pollution, while also helping to improve lung health across the St. Louis area. • Walk or bike to class: For kids that live close to school, walking and biking are great commuting options that also offer an opportunity to get some exercise, whenever weather and air quality conditions are favorable. • Encourage the kids to ride the bus: For those who live near a school bus route, the bus can offer an eco-friendly way to get to class, especially as more districts purchase lower pollution buses. • Share the ride to school: If driving to school is the only option for getting there, work with neighbors to organize carpools to reduce emissions and also help parents and students save money on gas. • Avoid unnecessary idling: Idling engines produce toxic pollution that is known to cause serious health concerns. Exposure to car exhaust can also aggravate asthma symptoms. And with asthma ranking as the most common chronic illness in children, vehicle idling can be especially harmful to kids. When dropping the kids off, avoid idling parking lots, bus and carpool lanes and delivery areas. At back to school time, and year-round, parents and kids can access a wealth of air quality information and tips to help them do their share for cleaner air on the Clean Air Partnership website. Additional air quality tips and information can also be found on our Facebook page and on Twitter @gatewaycleanair. For most people, your car is your most valuable possession. Your vehicle helps you pay the bills by getting you to and from work. It’s reliable. It’s convenient. But, it can also be an air pollution nightmare. Vehicular traffic is the leading source of air pollution in most U.S. cities, according to the U.S. Environmental Protection Agency (EPA). Although you may not be able to see it, your car’s tailpipe pumps out pollutants such as carbon monoxide, hydrocarbons and oxides of nitrogen. Hydrocarbons and oxides of nitrogen react on hot, sunny days to form ground-level ozone. During the summer, high levels of ground-level ozone make it difficult for many people to breathe. That’s the bad news. The good news is that there are a variety of steps you can take to make sure your car isn’t a pollution machine. Maintain your vehicle on a regular basis. When a vehicle is not properly maintained, its pollution control devices will eventually fail, causing increased emissions. To avoid releasing excessive emissions into the air, follow the recommended maintenance schedule listed in your owner’s manual. Preventative maintenance tips are also available through the Gateway Clean Air Program. Is your “check engine” or “service engine soon” light on? Responding quickly to this malfunction indicator light can save you money! The light notifies you when something in the engine management or emissions control system has failed or deteriorated. Early diagnosis and repair can prevent more costly repairs, such as replacing a catalytic converter. Responding to the malfunction light in a timely manner will prevent excess vehicle emissions, which improves overall air quality in the region. The less fuel you burn, the less pollution comes out of your tailpipe. Over time, a fuel-efficient vehicle will save you money in refueling costs. When shopping for a new vehicle, compare the gas mileage ratings of several vehicles. More information is available on the EPA’s Web site at www.epa.gov/autoemissions/. If your current car is a gas-guzzler, there are ways to improve its gas mileage. Remove unnecessary weight from your vehicle – leave the golf clubs in the garage; take the bag of sand out of the bed of your truck as soon as the ice disappears. Accelerate slowly, and drive at a steady speed. You can improve your gas mileage about 15 percent by driving at 55 mph rather than 65 mph. Reduced gas mileage is an indication that something might be wrong with your vehicle. Take it to a repair shop for diagnosis and repair. Did you know that spending an extra 10 minutes sitting in traffic during your commute can quickly adds up to 84 hours in the car per year! Traffic is wearisome, not only for you but for your health. Fumes from car exhaust, which mixes with heat and sunlight to form ground-level ozone, makes it difficult for us all to breathe. However, you can help clear the air in our region this summer by not driving in your car alone during rush hour traffic. Impossible, you think? Here are some commute ideas for you to consider. The first option is to consider an alternate mode of transportation to work. The MetroBus and MetroLink have routes that cover St. Louis on both sides of the river, and you can log onto www.metrostlouis.org to find a schedule and route near you. Services are available for Madison County, Ill. residents from Madison County Transit at www.mct.org. In addition, Citizens for Modern Transit (CMT) offers opportunities to register your home and work addresses online via its website at www.cmt-stl.org and receive a personalized transit route from home to work, the schedules and service times for your commute. If transit isn’t an option,try carpooling to work—it’s as easy as calling Ridefinders at 1-800-VIP-RIDE or visiting www.ridefinders.org. Carpooling saves miles and wear on your car, and gives you someone to talk to during those long daily commutes. RideFinders can match you up with a list of potential carpoolers that both live and work near you. An added benefit of transit and carpooling is the Guaranteed Ride Home (GRH), an incentive that provides a limited number of subsidized cab rides in case of an unexpected emergency. Both CMT and Ridefinders offer the GRH for those who use transit and carpool and vanpool. Other programs, such as flextime and a compressed work week, may also be available through some employers. Flextime changes the hours of an employee’s workday. For example, instead of working the typical 8 am to 5 pm shift, employees flex their schedule to work 6 am to 3 pm, 10 am to 7 pm, or any other combination the employer agrees upon. A compressed work week changes the hours of your day into longer shifts, working 10 hours a day four days a week, allowing you to avoid rush hour traffic and giving you one extra day off every week! Choosing any of these options makes sense in many ways— it saves you time and money, and, since your car is idling less in traffic, it is polluting less and helping to reduce the thousands of pounds of pollution our cars create EVERY DAY. Clean air is everyone’s responsibility; so set a good example for others by taking action and try a more environmentally friendly commute.